Hi all, and a warm welcome to December’s newsletter and a special greetings to all those who have joined during the past few weeks. I’d like to take this opportunity to wish you a Happy Christmas and peaceful New Year. You may have noticed the cut down trees when travelling up and down the A610. A number of people have made comment about this and I’ve made enquiries with both Broxtowe Borough Council and Nottinghamshire County Council. The information I have received indicate that this work has been carried out by the County Council (they instructed the work to proceed). No immediate explanation of the reasons for the removal have been given, though I understand that some concerns have been raised previously by some house owners nearby about poor tv reception and light issues. The WEA which operates out of Rumbletums in Kimberley on Victoria Street, are launching a new course in January next year. 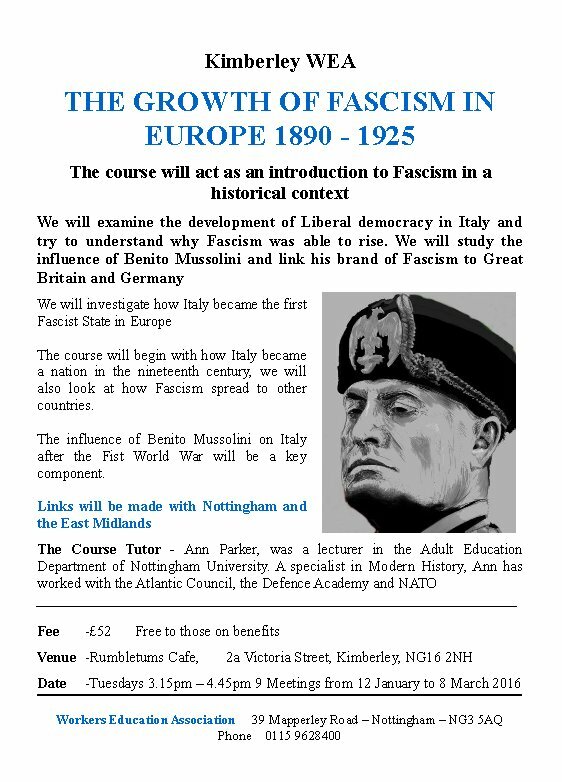 This will be specifically about the growth of Fascism in Europe between 1890 and 1925. The report resulting from consultations earlier this year has now been written, and I want to discuss the findings with all residents who are interested, so we can work together in trying to find some workable long-term solutions on traffic flow, parking, congestion and so on. This will be a major piece of work in 2016. Copies of the report will be made available in January in electronic format, and there’ll be some hard copies at the sessions above too. Thanks in particular to Kimberley residents Sue Page and John Sykes for their help and suggestions in compiling the reports. If anyone has any questions before January please let me know. I’ve asked Broxtowe Borough Council Environmental Health to push the County Council for noise monitoring to be undertaken. It’s a long haul but I’m determined to persist with this until the County Council finally assent to work they originally committed to several years ago. I met with representatives of KSC on Thursday 4 December 2015 to learn more about their work and understand some of the frustrations they have in planning ahead with their programme of activities. In particular there are concerns for example about their ability to be able to keep providing swimming lessons in the teaching pool at Kimberley Leisure Centre. Kimberley Swimming Club are a well established voluntary organisation that enjoy a large amount of public support locally, have a very good track record in supporting our youngsters and in achieving awards, and are a well run club. I have made strong representations to Broxtowe Borough Council on behalf of KSC and as I write await a response. If anyone has questions please let me know. The County Council is to begin issuing penalty notices to motorists who park their cars across dropped kerbs which are there to help vulnerable pedestrians cross the road safely. Dropped kerbs are provided to help pedestrians cross the road, enable wheelchairs to pass from footway to carriageway and help visually impaired and blind people to know which direction to take. Any part of a vehicle encroaching into the crossing area can create an obstruction. Pedestrian crossing points may consist of lowered kerbs or raised carriageway to create a smooth crossing. Tactile paving to assist the blind or partially sighted is also usually provided. These crossing points are essential to assist all pedestrians when crossing the road and they are particularly important for the disabled or those with pushchairs. Enforcement began on Monday, December 14 this week. A vehicle does not have to be fully obstructing the crossing point area. A Civil Enforcement Officer can issue a Penalty Charge Notice if any part of the vehicle is obstructing the crossing area. The Highway Code already advises drivers not to stop or park where a kerb has been lowered to help wheelchair users and powered mobility scooters; in front of an entrance to a property or where they might obstruct cyclists’ use of cycle facilities – except when forced to do so by stationary traffic. Paddy Tipping our Police & Crime Commissioner for Nottinghamshire has announced information relating to grants totalling £250,000. These are duly available to local crime prevention groups looking to develop new projects. The maximum grant per group is £25,000 and they will be available for projects running from April 2016 to March 2017. Great offers on leaflets, business cards, letterheads, compliment slips, newsletters, flyers, postcards, invitations, booklets, posters, menus, roller banners, pop up displays & much more. Specialists in digital print at competitive prices. Rumbletums opens from 9 30am to 3 00pm from Tuesday to Saturday at 2a Victoria Street,Kimberley(on the corner of Victoria Street and Newdigate Street, opposite Kimberley Parish Hall). Phone 0115 9384953. This entry was posted by Richard Robinson on December 15, 2015 at 12:27, and is filed under Newsletter. Follow any responses to this post through RSS 2.0.Responses are currently closed, but you can trackback from your own site.